In successive Norfolk summers of a little more than a century ago, a raggle-taggle procession could be seen setting out from Swainsthorpe bound for the gipsy life in Costessey, Taverham and the Ringland Hills. The nomadic party was led by a Norfolk character if ever there was one - a singular mixture of toff and ruffian with a strong line in expletives after a beer or three. He was a young artist named Alfred James Munnings who, having been raised at Mendham Mill on the River Waveney, was now making his name as an impressionistic conveyor of horse-centred local scenes. In fact he was our very own Degas. And this although he had already lost an eye when colliding, during a walk in idyllic Norfolk countryside, with a briar. Later on his pioneering vision would be blinded by extreme reactionary views which had the effect of eclipsing a ravishing and radical talent for an art world which continues to ignore him. But on those summer mornings in and around 1910, "AJ" was to be found riding a brown mare with the whole world before him. He was followed by a blue wagon drawn by a Welsh mare and with a fine white colt called Augereau trotting at her side. Holding the reins was the striking figure of a teenage vagabond named George Curson. The son of a former maid from Narford Hall near Swaffham - who had reputedly been put in the family way by a member of the Fountaine family, (a claim forever lodged in that misspelt second name) - was known to one and all as Shrimp. The wiry and wily horse-mad lad had been dressed for the part of the artist's favourite model by a Norwich tailor at AJ's expense. Now he was resplendent in boots, cord trousers, black and grey waistcoat with pearl buttons, bright neckerchief and cloth cap. A pony and a donkey were tied to the wagon, while a horse-drawn cart containing painting and camping gear and steered by Bob, a dour handyman, brought up the rear together with a terrier called Joe. It wasn't such an unusual sight then, for Norfolk in general - and Mousehold in particular --was a centre of authentic Romany clans and caravans on the move between horse fairs in places such as Norwich, Bungay and Lavenham. And one recent summer a similar arty party consisting of the highly bohemian family of painter Augustus John had sought to meander through the eastern counties as far as Sea Palling before several wild children went down with croup and the expedition was abandoned. But the name chalked on the side of the Munnings caravan, as required by law, added to the spirit of illicit adventure. It read "Jasper Petulengro, Swainsthorpe, Norfolk." Looking back on the start of a 15-mile journey to two fields he had rented at Ringland, AJ recalled "a thrill of adventure about the whole thing'. Bob and Shrimp would camp out in the fields, while the master retired after long days of painting to the relative comfort of the Falcon Inn in Costessey (now a private house) for a weekly, tariff of seventeen shillings and sixpence. He dreamed of paintings. "The mere sight of the ponies, coming or going, or different placing of groups, gave me fresh pictures," he was to write in his wonderfully colourful memoirs. In the blazing sunshine and brilliant calm of those rural summers before the First World War, and also shortly before terrible trauma in his private life, Alfred Munnings was in his element and producing his finest art. But one day the peaceful proceedings were shattered by the arrival of two police officers bearing an arrest warrant for Shrimp. The source of the trouble was a fight at Bungay Horse Fair several months before (the county constabularies moved slowly in those days). The miscreant confessed to the charge and his panicky employer, fearing the loss of a priceless model, and although famously tight with his money, readily paid a fifty-shilling fine to keep him out of jail. There would be violent verbal confrontations between master and model, especially after the drink, and rather often after Shrimp had vanished for the night with a passing girl. The alternative Costessey hostelry at this time was The Bush, notorious for prostitutes who would have won no custom from this particular artist. He preferred to sketch the musicians entertaining customers in the beer garden. 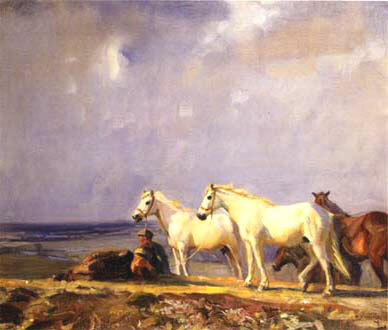 When the restless Alfred Munnings eventually tired of the Ringland retreat and plotted roving adventures far further afield, Shrimp and Bob were told to return with horses and kit to his base at Swainsthorpe. There the artist handed his ex-model the earnings he had saved for him over several years - he would have drunk away weekly wages - and also gave him a horse and the blue wagon on which the name of Jasper Petulengro had now been replaced by that of- Fountain Page. Shrimp, who had never owned anything more than the clothes he stood up in, drove off without a word (and promptly sold his new possessions at a nearby pub). His true legacy would be as the model in those marvellous pictures now forever in his youthful prime in the height of summer and amid the horses he loved. Alfred Munnings then migrated to live among the pioneering painters in Cornwall where he fatally fell for Florence Carter Wood, the sister of one artist associate. Inevitably his beloved looked magnificent on a horse. They were married on January 19th 1912, a fact not even mentioned in all the hundreds of thousands of words in the artist's later, three-volume autobiography. For the marriage was a disaster from the outset, and the bride soon attempted suicide by swallowing cyanide. Her life was saved by the couple's painter friend, Laura Knight. In April 1913 Florence made sure she was not disturbed while drinking poison until it was too late. The widower then obliterated, her name and her mysterious tragedy from his story. His art hardened also. Norwich Castle Museum and Art Gallery has some marvellous paintings from the youthful heyday of Alfred Munnings but the world's largest and most comprehensive collection of his pictures - including the contents of his studio on his death in 1959 - is in his namesake museum at Castle House, Dedham, Colchester, Essex C07 GAZ (01206 322127, www.siralfredmunnings.co.uk).